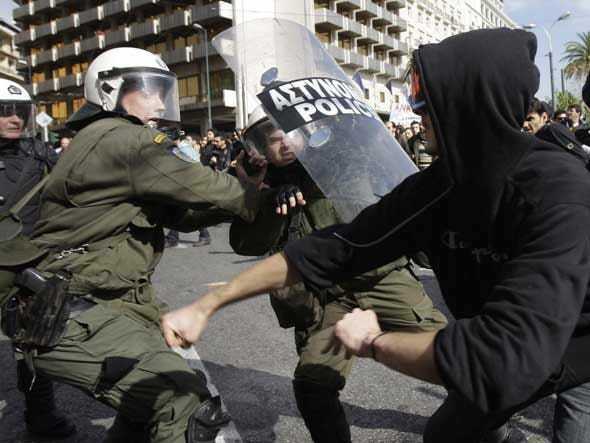 One has to wonder if Greek rioters even know what they are rioting against, or for. The Associated Press has reported that the leader of Greece’s largest union has been assaulted by masked youths, as a huge surge of violence erupted across Athens. Demonstrators attacked the two military guards and their escorting officers, smashing windows and kicking the guard posts. Masked youths then attacked the head of Greece’s largest trade union who was addressing the crowd. GSEE [The union] head Yiannis Panagopoulos traded blows with the rioters before being whisked away bloodied and with torn clothes. This is the same largest union that just held work stoppages to protest the austerity measures. So are these pro-austerity protesters? Doubtful, it’s far more likely they’re just confused… but feel free to correct us if information comes out. Regardless, latest violence is being billed as the worst since 2008. Thus things just got a lot worse in Athens.